Looking after fish successfully requires a lot of attention. Sometimes it's difficult to be there exactly when your fish need you, especially if you have fish who need to be fed at frequent intervals or at awkward times, such as during the night. Automatic fish feeders can be a great help, but what options are available, and how can you choose the best one for your aquarium? The most important thing you'll need to consider when choosing an automatic fish feeder is how long you'll need it to run for. Even a stable, healthy aquarium should never be left unattended for more than three weeks, so if you're going away for longer than this, make sure you arrange for somebody to visit your home and check your tanks, letting you know about any problems. However a feeder can take care of day to day concerns. If a fish feeder is going to run for weeks rather than being topped up every day or two, it's important that it be fully damp-proof. If moisture is able to get inside it, the food stored there can become mouldy, placing your fish at risk; it can also clump together so that it won't come out at all. Pellets and tablet foods are less likely to do this than flakes and are generally a better choice for automatic feeders, if your fish will accept them. Most automatic fish feeders are battery powered so you won't need to worry about potential power cuts. Remember to put new batteries in them before you go away for any length of time. Some feeders can only be set for a limited period, so make sure you choose a model with suitable settings if you're going on holiday. Automatic fish feeders offer various options when it comes to timers. The cheaper models can be set using dials and are quite sufficient for unfussy fish, but usually offer limited options. If you want to feed your fish more than two or three times a day, you may need a more expensive, fully programmable feeder. Some automatic feeders now come equipped with light sensors, giving you the option of synchronising feeding with natural light cycles. This often works to minimise stress in fish who, like humans, naturally tune their metabolic cycles to fit in with what the sun is doing. It's a particularly good option if you have fish who won't come out of hiding until it's dark. It's always advisable to test an automatic feeder before leaving it to operate on its own. Try to make sure that timer settings fit in with your fish so that they are happy to eat up food as soon as it's released. 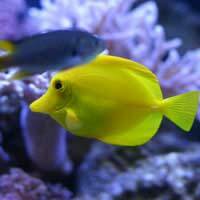 The longer food stays in your aquarium before being eaten, the greater the risk of bacterial build-up. Using an automatic feeder might not seem like an option that's open to you if your fish need to eat live food, but new models on the market can cater to this too. Most work using dried eggs which can be stored in a moisture-proof chamber and dropped, at intervals, into a water chamber, triggering them to hatch. The hatched larvae or shrimp will then swim into your aquarium. Because bacteria can build up in their water chambers, live food feeders need to be checked and cleaned more often than other types. Before investing in one, you should also make sure that you have a reliable source of suitable eggs to use in it, and you should test it for a day before each occasion that you leave it unattended. How do I start fish breeding example how can I start producing eggs/ baby fish. can a big fish lay her own egg in my tank or pond is there any way I can start my Tilapia fish farming. can I start with a hand full big Tilapias.